Join us for an entertaining and educational workshop with Tim See. 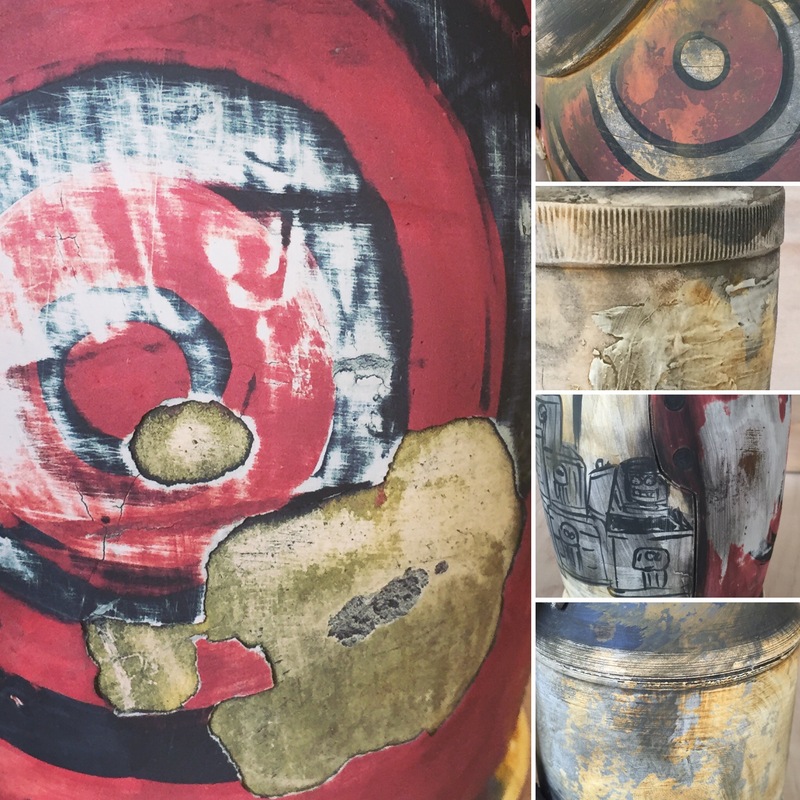 From inspiration and design to making and finishing, join Tim on an exploration of the oil can form. Covering processes like throwing creatively, spout pulling and complicated surface treatments, nothing will be left out. The discussion will focus on the whys of what he does as much as the how. Join me for an intensive, but fun, four-day potter’s camp at the acclaimed Stone Quarry Hill Art Park. This hands-on workshop will offer you many hours of instruction, practice and lodging. The number of participants will be limited to 8 on a first-come, first-served basis. A waiting list will be developed in case a cancellation opens a spot. ARRIVAL: You are welcome to arrive on Wednesday to settle in and prepare for our throwing extravaganza! The fee for the workshop is the same whether or not you will be staying overnight at the Artist Residence. If you are commuting, please respect our community by arriving on time and attending every session. INCLUDES: 24 or so Hours of Demo & Practice with Me! 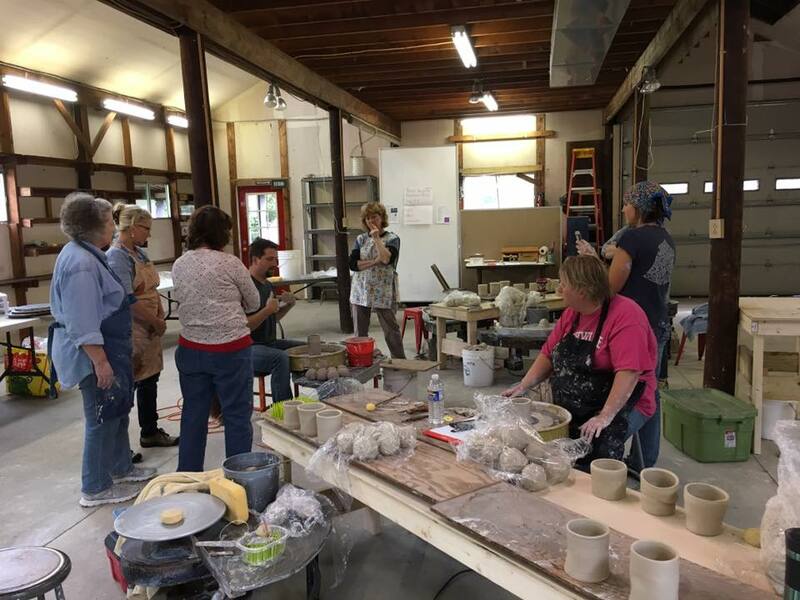 Optional Field Trips – to Clayscapes Pottery, Inc. The Stone Quarry Hill Art Park www.sqhap.org is the brainchild and gift to the community of Dorothy and Bob Reister. The mission is to educate and engage the public through exhibitions, collections, interpretation, and community outreach programs in the arts. The park encompasses over 104 acres in a rural setting and includes more than four miles of trails speckled with outdoor sculptures in fields and forest. Trails are open dawn to dusk 365 days a year. The Reister’s originally purchased this picturesque land as a summer home in 1958 and it became their year-round residence in 1965. Stone Quarry was incorporated in 1991 as a not-for-profit. In 2011, its 20th anniversary year, it was listed by National Geographic at No. 2 on a list, “Top Ten Sculpture Parks and Trails” in “Secret Journeys of a Lifetime, 500 of the World’s Best Hidden Travel Gems.” The home and studio were placed on the National Register of Historic Places in 2014. Stone Quarry is located in the town of Cazenovia with a population of 7,000. The village of Cazenovia is charming with a laid-back main street that features a sparkling lake. See www.Gocaz.com for information. All participants may stay at the Artist Residence that has 4 bedrooms with 2 single beds each. Bed linens and towels are available but participants are encouraged to provide their own. The pillows, linens and towels have been donated to the park. There are 2.5 bathrooms. The laundry will come in handy so you do not have to travel home with muddy clothes! We have access to two refrigerators in the Artist Residence and one in the Barn where the pop-up studio will be located. You are welcome to bring groceries or purchase them from a grocery store located just minutes away. The kitchen has a stove/oven, dishwasher, toaster and a microwave. Potters will graciously clean up after themselves before leaving the kitchen, of course! Breakfast and snacks: A “Kitchen Kitty” provides simple breakfast and snack fare as such as eggs, cereal, bread, fruit, granola bars, condiments, pickles, coffee and tea. Lunch: Within a short drive there is a grocery store (that makes enormous subs and has a salad bar), 2 diners, 2 coffee shops, 2 pizzerias and a McDonald’s. Chipping in for pizza is easy for at least one lunch. Dinner: Once your registration is finalized, I will be in touch about any unique dietary requirements to consider when stocking the Kitchen Kitty. I will also provide you with a list of dinner options in Cazenovia and in Syracuse (for Friday night). Saturday night I will join you for dinner and may even break out the barbecue to dazzle you with my short order cooking chops! Bring throwing clothes and an apron or towel. When you are out of the Park you will notice Central New Yorkers dress casually wherever they go! We may be infamous for our snowy winters but we are famous for glorious summers and falls! Our weather is changeable so come prepared for anything, though! I recommend waterproof hiking shoes or sneakers to ensure you will be able to explore on the trails at the Art Park! Cazenovia sparkles in June with lush greens, flowers, and the picturesque Cazenovia Lake dotted with sailboats and kayakers. The Farmer’s Market will be in full swing on Saturday in the village. You can plan for temperatures to range from a high of 75 to a low of 52 degrees. Fall in Central New York is a beautiful season! Expect our leaves to be changing but not at peak. Comfortable temperatures will range from a high of 70 degrees to a low of 50 degrees. The nights and mornings will be cool so bring clothes to keep you warm. Hancock International Airport – Our local airport in the City of Syracuse is small and very manageable. The airport is approximately 20 miles away and ground transportation will be costly. A car rental may be the best way to go. Once Registration is finalized for each session I will make a Facebook group for communication. You could try to coordinate arrival and departure times with other potters and split the cost of the car rental. We are grateful for the support of Clayscapes Pottery, Inc., www.clayscapespottery.com. Their donation of clay is just one example of their generosity in building clay communities throughout Central New York. Thank you to Stone Quarry Hill Art Park staff Emily Zaengle, Executive Director, Stephen Brucker, Visitor Services and Site Promotion Coordinator and to the rest of the staff and Board of Directors for their assistance with this program and their efforts to preserve this treasure. Depending on the size of your studio and the requirements of your system this list will change but here are the basics going right from the bottom drain of the sink to the exit drain of the system. First things first, measure and get an idea where your trap is going to go, the space you have and where your inlet and outlet need to be. Make some drawing and such before buying every plastic bin and picking the two that work. Step two is to cut the holes needed in the sides of both bins and the tops of both containers. On the sides make the exits for the bulkhead union as close to the top as possible and the entrance through the lid on the opposite side of the bin. I cut my holes with a Zip bit for the dremel tool and a sanding drum to get them just big enough to slide the pipe in, this will cut down on smells coming from the bins. Step three is to layout the system dry. Make sure everything fits and you have the parts you need. Cutting the pvc can be done with a hack saw but is easy with a mitre saw. The fourth step is to prime and cement connect your non threaded pvc joints. I used teflon tape to seal the threaded parts, the bulkhead union uses a rubber gasket to make the seal to the container. No need to glue or seal this joint. The install of the trap is going to depend on where your outlet is going to be and how tight your cabinet is. The Sink trap bins have been going now for a year and have done well. I have cleaned it once to check how much was collected and how much is getting past the trap. All looked pretty good the only stuff getting past is like Terra Sig. The capacity of the two bins looks like it could go two years before getting cleaned out with how I use my sink. I have added a small bucket in my sink that has holes made 4 inches or so above the bottom I pour and wash everything into this bucket. it allows for a slower trickle of water through the system to prevent washing stuff out of the buns with big flush of water. Are you a fan of my Periscope sessions? Learned a lot from my videos? Find yourself chuckling over my Clay Buddies posts? Thought my Process Demo at the 2016 NCECA was informative but too short? 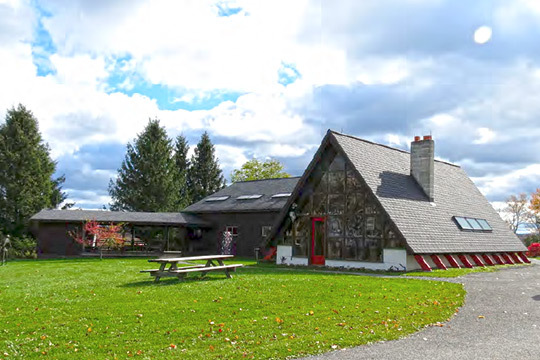 I will be conducting an intensive, but fun, four-day potter’s retreat in a rustic barn and artist’s residence at the acclaimed Stone Quarry Hill Art Park. Note: You are welcome to arrive on Wednesday, September 21, 2016 to settle in if you are coming from a distance. REGISTRATION: Full payment should be paid to my PayPal account, timseeclay@yahoo.com; $675 will secure your spot. In the event you need to cancel and I can fill your spot from the waiting list, a $25 fee will be deducted from your refund. If I cannot fill your spot, a refund of $350 will be issued to your account. Includes: 20 Hours of Demo & Practice with Me! 4:00 – 4:30 pm Spruce Up! The Reister’s originally purchased this picturesque land as a summer home in 1958 and it became their year-round residence in 1965. Stone Quarry was incorporated in 1991 as a not-for-profit. In 2011, its 20th anniversary year, it was listed by National Geographic at No. 2 on a list, “Top Ten Sculpture Parks and Trails” in “Secret Journeys of a Lifetimes , 500 of the World’s Best Hidden Travel Gems.” The home and studio were placed on the National Register of Historic Places in 2014. All participants may stay at the Reister Hilltop House that has 3 bedrooms with 2 single beds each. Towels and linens will be provided. There are 2.5 bathrooms and a full kitchen. The laundry will come in handy so you do not have to travel home with muddy clothes! Breakfast and snacks: A “Kitchen Kitty” with funds from the Registration fee will buy such simple breakfast and snack fare as eggs, cereal and/or granola, bread, fruit, granola bars, nuts, condiments, pickles, coffee and tea. Additional supplies can be purchased from a local grocery store. Participants will prepare what they want to eat and clean up after themselves. Lunch: Within a short drive there is a grocery store (that makes enormous subs and has a salad bar), 2 diners, 2 coffee shops, 2 pizzerias and a McDonald’s. Take-outs are also available at more upscale restaurants. Dinner: Thursday we will either eat out or order in and Friday we will eat in a Syracuse restaurant; everyone will pay their own way. Saturday night Tim, and his wife, Brenda Pierce, will host a barbecue at their home. Once your registration is finalized, I will be in touch about any unique dietary requirements for planning purposes. The hope is to keep things simple but healthy, with some Central New York flavor. Fall in Central New York is a beautiful season! Expect our leaves to be changing but not at peak. Comfortable temperatures will range from a high of 70 degrees to a low of 50 degrees. Our weather is changeable so come prepared for anything. The nights and mornings will be cool; I recommend waterproof hiking shoes to ensure you will be able to explore on the trails. Don’t forget throwing clothes! Hancock International Airport – Our local airport in the City of Syracuse is small and very manageable. Ground Transportation – Since the airport is approximately 20 miles away I plan to do my best to provide ground transportation. Bearing this in mind, please keep your arrival and departure times to reasonable hours that do not conflict with the workshop schedule. Please coordinate with me if you have any questions. We are grateful for the support of Clayscapes Pottery, Inc., www.clayscapespottery.com. Their generous donation of wheels and clay is just one example of their generosity in building clay communities throughout Central New York. Thank you to Emily Zaengle, Executive Director of Stone Quarry Hill Art Park, and to the rest of the staff and Board of Directors for their assistance with this program and their efforts to preserve this treasure. This year will be my first NCECA in over a decade! I am REALLY excited to be at the 50th Anniversary milestone! While I am there I will be wearing many hats: Process Room Demonstrator, NCECA Social Media Team, and, Clayscapes Pottery, Inc. Representative. I wonder how many of the 11,000+ Clay Buddies I will get to meet? Will some of my 400+ Periscope friends be there too? The fun starts for me on Monday, March 14 when I fly in and then ends when I fly out on Saturday the 19th. I’ll be rooming with Drew Seymour; I will have to keep an eye on him so he doesn’t get us in trouble! As soon as I hit the ground at the conference center I spring into my role as a Social Media Team member for NCECA! They gave me a Press Pass so I will look official (and feel important). You will be able to get real time information about the conference on Instagram, Facebook, YouTube and Periscope at #nceca2016. My assignment is to use Facebook and Periscope to keep both conference attendees and folks at home in the loop! I will be popping over to the Clayscapes, Pottery, Inc. Booth, number 527, in the vendor hall throughout the conference. Who knows? I might even do a bit of demonstrating. Don, Kim and Drew Seymour will be there taking orders and showing off examples of the 29 Clayscapes Glazes – both alone and in some great looking combinations. (Fun Fact: Did you know that the 7 celadons in the collection are made from a base glaze I developed?) 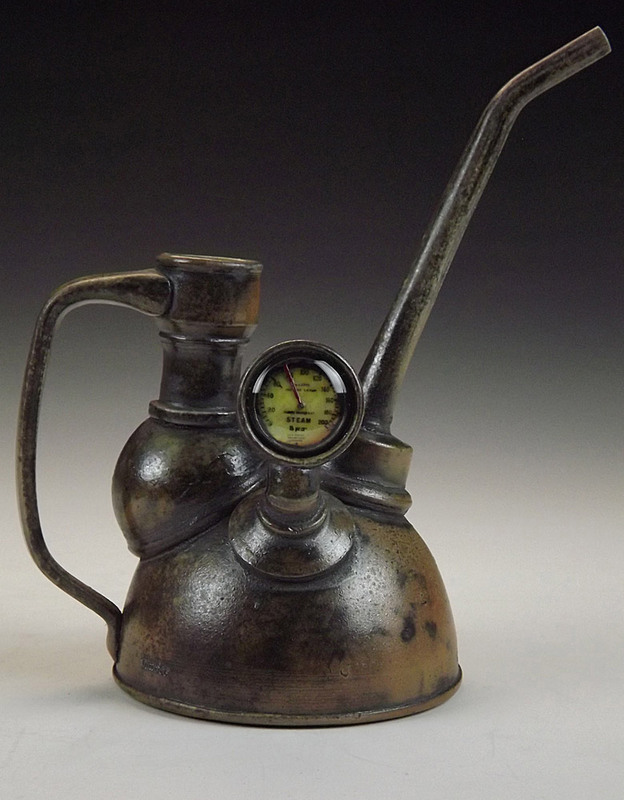 A new group of nine additional glazes, called the Brooklyn Line, will be unveiled at NCECA for the first time. We expect many customers are going to be excited by this rainbow of colors which have tested beautifully. Clay Buddies should flock to the Clayscapes Booth, number 527, to pick up their complementary CB buttons designed by Kim Seymour, and, yours truly! They are larger than last year’s in a bright blue and orange so we should be able to spot each other easily. I will be posting info on the day and time of the Clay Buddies Shot Glass Exchange to be held in the Clay Art Room. It will be a blind exchange. For every shot glass you contribute, up to a maximum number of 5, you will get to pick a number at random that corresponds to the one you will get to bring home. A main event in Tim Bob’s world will be my Process Room demo, Putting Together Oil Cans on Thursday, March 17 from 11 – 11:30 am. While I am assembling the parts into a can I will be gifting you with my blarney about how I approach each stage of decision making, how I avoid making the same thing over and over again, and tapping into our creativity. It will be awesome to have friends in the audience who will heckle me – you know I thrive on heckling! I volunteered to do 2 half-hour Student Critique sessions – which are scheduled before the Process Demo on the 17th. The 9:30 – 10 amslot is still open and the student who signed up for the 10 – 10:30 slot seems very interested in industry-inspired pottery too. One of the smells from my childhood is Bondo (automotive repair putty). That fiberglass resin smell seeped into our house from the garage. It was the smell of summer, the smell of a mechanical beast that lurked in the garage. My father likes to restore cars and the fun part of that was bodywork. He used primers and fillers, paint and then clear coat, each with their own distinctive smell. A few years ago, at the very end of my working in cone six, I made a piece that had a touch of that resin smell in it. This winter I remembered doing bodywork with my Dad, Kevin. He let me help on a few vehicles (my own) and it went something like this: sand until you get to clean metal, paint on the rust blocker stuff, coat with primer, fill holes with fiberglass filler, take off the extra, prime, wet sand, wet sand, wet sand, and paint. In my recent work I recreated those steps on a few pieces, with the exception of the paint step, which I leave to the wood kiln. I won’t be the reason for the fish eyes or drips and sags, I can blame that on the kiln. It is pickle-planting season! My wife Brenda and I are deep in discussion about what kinds we want most, and how many to plant. Are we doing Sweet Jalapenos this year? Gardening is one of my hobbies; it helps keep me from being just a clay person. Having interests besides clay keeps me fresh for ceramics. It also gives me a serious-sounding justification to purchase and maintain old yard equipment – simple, well-built machines with a story older than I am. The gleaming new machines at the local tractor supply are more glamorous to me than celebrities walking the red carpet. “I need a Power Take-Off (PTO) rebuild kit for a 1969 Cub cadet 106,” I say. “Is it for sale,” my friends behind the counter ask eagerly. The let me know where they saw a tractor being dismantled for parts, or another implement they know would jazz me up and we chew the fat. Planting new trees, starting a whole new bed give me reasons to get out the rototiller and make a lot of noise! Having built my private home studio in 2014, I have a new space in which to create that is free from distractions. Not that there is anything wrong with distractions! 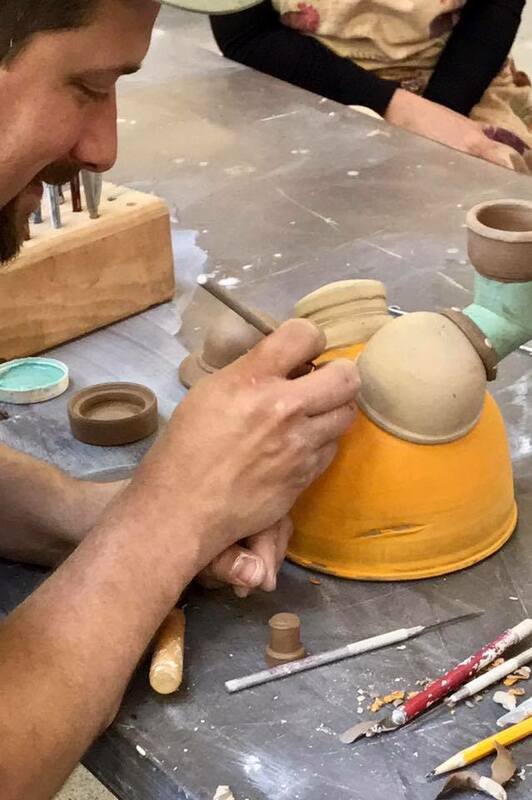 I enjoy working in my studio at Clayscapes Pottery and interacting with my colleagues and students too! Having both is ideal for me. In the spirit of always pushing forward I spent a large amount of time this winter exploring alternative ways of creating surface and form. The quiet home studio was conducive to drawing more in sketchbooks and thinking through where I wanted my work to go next. Some of the changes were simple, others were time-consuming and complex. The focused attention I can give to a piece has meant big changes to everything I am doing. For instance, I made industrial-style functional pieces that not only look like they are composed of many separate pieces, but actually are composed of many pieces. I cut up pots and then reassembled them for a more authentic look and feel. 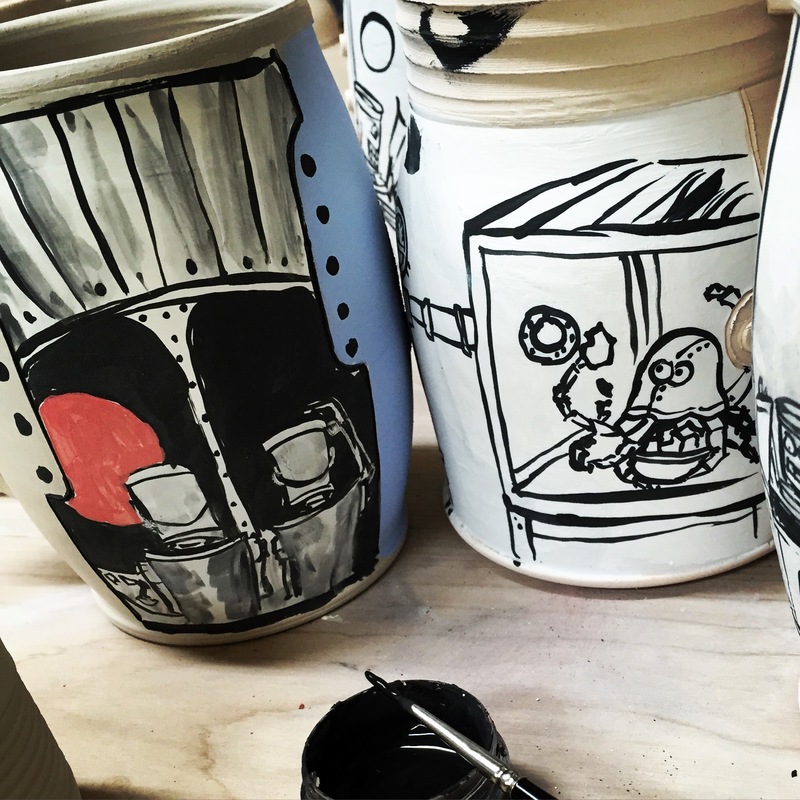 The spring wood firing will include a broader color palette, layered slips, tabbed faux separations and less refinement of pieces that really should be rough and crunchy. The changes enlivened the pourers. I interpreted the industrial-style in a new series of goblets. A character in The Buckethead Story, Bunny Foo Foo, quickly became infamous in startling ways.